Links: Daisy, Earrings, Necklace, Hat, Headpiece, Dress. All links found via Pinterest. I don’t know about you, but I am so excited for this latest adaptation of The Great Gatsby to hit theaters. The Great Gatsby was one of my favorite high school reading assignments and I have always been a huge fan of Baz Lurhmann’s films. The way he incorporates music and imagery into his story telling is fantastic. Just seeing the previews, I am already impressed by the casting. Leonardo Di Caprio is going to make the best Gatsby yet (sorry Robert Redford,) and the chemistry between he and Carey Mulligan’s Daisy Buchanan looks to be hot to say the least! What I am most looking forward to, however, is the dynamic styling of the 1920’s. Beautiful beaded dresses. Long stands of pearls. Diamonds and lace. As spring marches forward, I expect to see more of these timeless items becoming trendy once again. I plan on trying to incorporate as many of these things into my own jewelry designs and there may even be a “copy cat” project coming up! 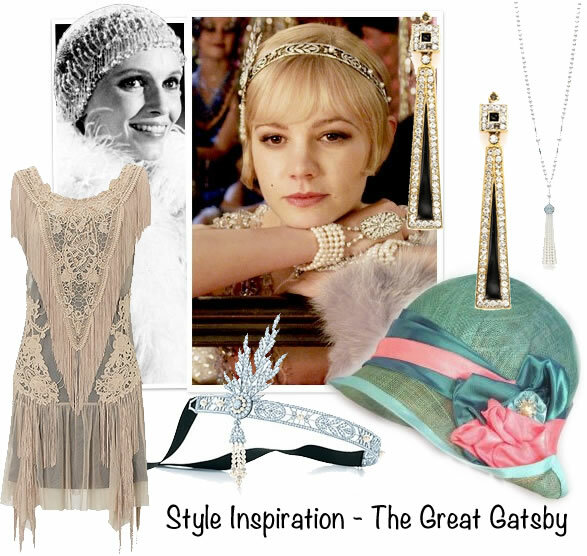 What do you think about the Roarin’ 20’s and the styling of The Great Gatsby? Let me know in the comments!